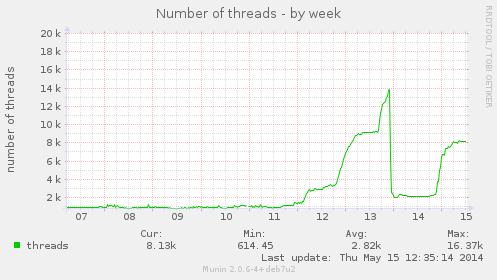 restart varnish twice due to what looks like a thread pool leak. since restart a day ago in this state. > restart varnish twice due to what looks like a thread pool leak. > since restart a day ago in this state. would be accepted, and held open, but nothing happened subsequently. but 4.0 clearly needs some work before it goes anywhere near production. > would be accepted, and held open, but nothing happened subsequently. > but 4.0 clearly needs some work before it goes anywhere near production. experimental, just as it was in 3.0. > > would be accepted, and held open, but nothing happened subsequently. > > but 4.0 clearly needs some work before it goes anywhere near production. > experimental, just as it was in 3.0. > > > but 4.0 clearly needs some work before it goes anywhere near production. > > experimental, just as it was in 3.0. 3.0 as in 4.0, so it should never be the reason for upgrading. > still experimental, just as it was in 3.0.
version is still viable so finding bugs isn't catastrophic! shouldn't be in the release imho. Experimental is certainly the wrong wording - deprecated, perhaps? and see how things work using the usual transient memory store. >> > would be accepted, and held open, but nothing happened subsequently. >> > but 4.0 clearly needs some work before it goes anywhere near production. >> experimental, just as it was in 3.0. > Experimental is misleading, it makes it sound like the code has a future. > We Make Websites Fly!